Now accepting orders for the Christmas Holiday Season! We are now accepting orders for Buch de Noel! We will be taking orders for this special Christmas treat until December 22nd. Chocolate sponge cake with coffee mascarpone filling, chocolate ganache, meringue mushrooms, white chocolate leaves. (Also available on request: vanilla scented mascarpone filling or chocolate mascarpone filling). Call 510-406-0998 or email us in the ‘contact us’ page to place your orders. End date for all Buch de Noel orders is December 22, 2018. Enjoy an elegant afternoon in the beautiful San Francisco Park 55. September 23rd from 12 p.m. to 4 p.m. Discover our magnificent caterers, meet photographers, florists, bakers, and more! Register at www.bayareaweddingfairs.com. Fill out the form and select which event(s) you are able to attend. Enjoy an elegant afternoon in the beautiful Walnut Creek Marriott. September 9th from 12 p.m. to 4 p.m.
Renaissance Cakes and Desserts will be hosting a pop-up event Friday, August 17th, at Rock Wall Winery. Bring your loved ones and relax with an amazing view, a glass of wine and something sweet. We are located at the entrance for your convenience. Pop-up event at Rock Wall Wine Company. We will be hosting a pop-up event at Rock Wall Wine Company Friday, August 3rd, from 4pm-8pm. As always bring your loved ones and join us for an evening of food, music and desserts. 2018 Pop-up Event at Rock Wall Wine Company. 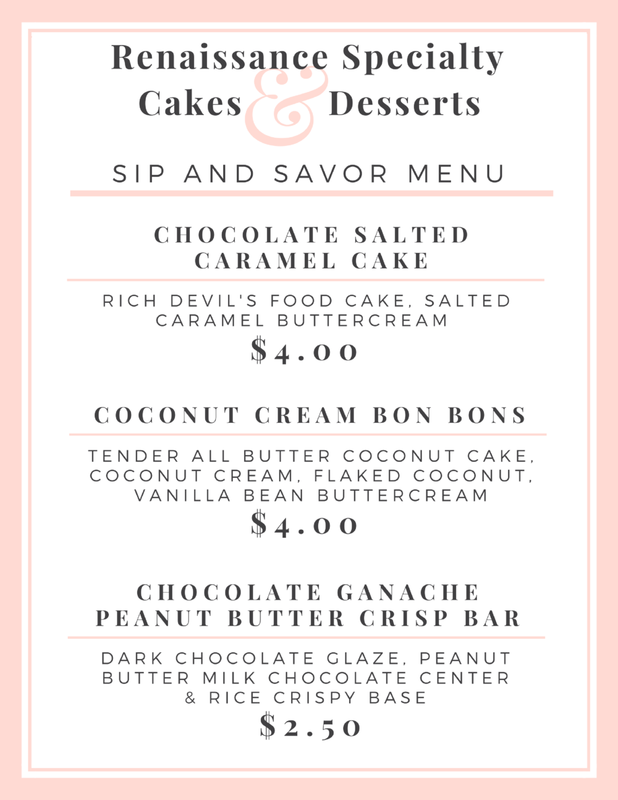 Renaissance Specialty Cakes and Desserts will be hosting a pop-up event at Rock Wall Wine Company Friday, July 27th, from 4pm-8pm and Saturday, July 28th, from 12-4pm. Bring your family and friends to this special event. Enjoy live music, wine and desserts. We will be at Rock Wall Wine Company on Friday, 7/20/18, from 4pm-8pm. Bring your loved ones and join us for an evening of fun and sweets. Enjoy an elegant afternoon in the beautiful Concord Crowne Plaza. April 8th from 12 p.m. to 4 p.m. Renaissance Specialty Cakes and Desserts will be in attendance with delicious cake samples and beautiful cake displays. Enjoy an elegant evening in the beautiful Brazilian Room. March 6th from 4p.m. to 8p.m. Taste the best of the Bay and Renaissance Specialty Cakes and Desserts at El Cerrito Rotary’s 8th Annual Cerrito Vista Sip & Savor. Join local leaders, business representatives and community champions as we gather for a delightful afternoon connecting and enjoying some of the best wine, chocolate, cheeses, and more the Bay Area has to offer. Tickets are $50 each, or two for $90 if you purchase by September 1st. We are thrilled to have a booth at the Solano Avenue Stroll this year. Get the opportunity to taste some of our delicious cakes and desserts. What a great way to end your weekend. Hope to see you all there!